Oh how adorable!!! I love this image and you certainly did it justice with your design around it...gotta go check out Your Next Stamp...TFS!! Hey Kerri, OH My what a darling Christmas image!!! Love the added texture and your beautiful bow!! Gorgeous card girl!!! This is ADORABLE, Kerri!! So sweet! Beautiful! I love the ribbon and your image is just so sweet. This is absolutely fabulous! 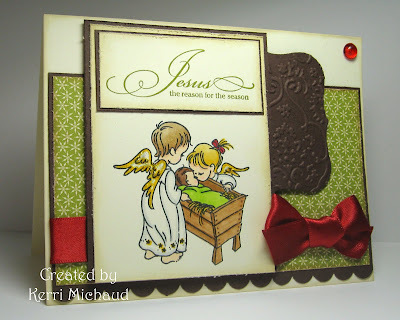 I love the embossed die cut, and your dew drop and ribbon are so pretty. What a darling little stamp! This is really precious, Kerri and I love the brown Nesties piece on the side; would never think to do that. Pretty pretty bow too! Love the color combo you used here, and that image is just precious! Love all of your layers and textures, and that red ribbon is gorgeous! I love that image and your coloring!!! It is absolutely gorgeous!! Great use of the sketch!! Wow! I missed so many cards, Kerri! This card is gorgeous! I love the vintage and peaceful look you created!